Google has reconsidered its plans for a modular smartphone and now plans to deliver a less customizable model than it had first introduced. The updated Project Ara handset no longer allows its main display or processors to be interchanged . Google’s first Ara smartphones will be equipped with slots for six modules that will let users add or upgrade features, Google’s officials said. The Company’s aim to build Ara, a customizable smartphone with swappable modules for different functions, such as cameras, speakers and battery packs.like Lego blocks — just by popping them on and off. 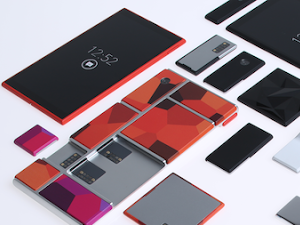 Google’s Project Ara modular smartphone will be available for developers soon, but it’s lost much from its customization vision along the way. Developers will be able to get their hands on a developer’s version of Ara by the end of this year. According to Google’s plan in 2017, Smartphones will go modular.